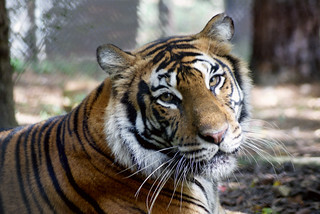 Becoming an adoptive parent is one way to connect with us at Carolina Tiger Rescue — and it’s very interactive. With an annual commitment and specialized training from our keepers, adoptive parents are allowed unlimited visits with their animal. This is a symbolic adoption, and it’s a fantastic opportunity for you to build a personal connection with an animal you love. There are more than 90 adoptive parents at Carolina Tiger Rescue! We’ve highlighted some of our adoptive parent stories in this video, and each path was different. One family came out for a tour and wanted to stay involved. Another was at first in the volunteer program. Someone even heard of us through a work program that piqued his interest. In the video, they also discuss some of the benefits of being an adoptive parent.